We would appreciate it if you would hit the "like" button on our Facebook page where you can also check-out some IFAD Photos! 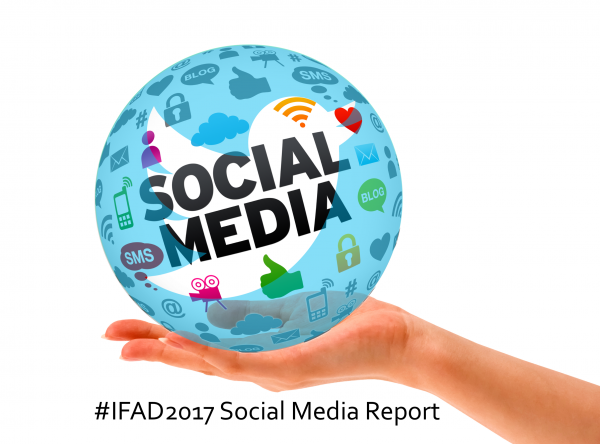 The final Twitter statistics of the #IFAD2017 (data collection period 20/09/2017 – 16/01/2018) are listed in the figure on the next page and have dramatically increased compared to #IFAD2015 with a total of 25,485,000 impressions, 11,092 Tweets, 1,567 participants and on average 4 Tweets per hour (official statistics on #IFAD2017 are accessible via www.symplur.com). The iFAD started as local initiative from the pharmaceutical working group on fluids from the Ziekenhuis Netwerk Antwerpen (www.zna.be). Today iFAD is integrated within the not-for-profit charitable organization iMERiT, International Medical Education and Research Initiative, under Belgian law and as such the iFAD Organising Committee strongly recognizes and values a constructive partnership with the delegates and industry. The founders of iMERiT are Prof. Dr. Manu Malbrain (Professor at Faculty of Medicine and Pharmacy, Vrije Universiteit Brussel (VUB) and ICU Director, University Hopsital Brussels (UZB), Jette, Belgium) and Dr. Niels Van Regenmortel (ICU Director, ZNA Stuivenberg, Antwerp, Belgium). At last IFAD meeting in November 2017, the Executive Committee of iMERiT also got a majority of international members by the appointment of Dr. Adrian Wong (from Oxford, UK), Prof. Dr. Paul Elbers (from Amsterdam, The Netherlands) and Prof. Dr. Xavier Monnet (Paris, France). Twitter is a microblogging site, founded in 2006, where users interact with a social network through creating or sharing posts. These may contain hashtags allowing aggregation of tweets to topics. Twitter has been used to amplify the reach of scientific conferences, with growing success. Tweets labelled with the conference hashtag allow unconnected individuals to join and participate in broader discussion stimulated by the conference – both locally and from a distance. Despite the increasing use of Twitter at critical care conferences, there remains debate as to its impact and ability to generate meaningful discussions beyond the duration of the conference itself. To analyse differences in hashtags and impressions (measure of impact) used at critical care conferences between 2015 and 2016. Six critical care conferences were identified, covering the regions of the USA (Critical Care Conference), Europe (LIVES, ESICM), UK (ICSSOA), Belgium (IFAD) and the international Social Media and Critical Care (SMACC) movement. Data analytics were obtained using the Symplur platform, an established tool to analyse Twitter traffic. The use of twitter and conference hashtags has increased amongst critical care conferences. At the exception of one international meeting (#IFAD2017), the use of conference hashtags is not sustained and drops off dramatically after the event itself. In order to prolong their use and presence, conference organisers should follow the example of the International Fluid Academy and consider the controlled release of educational material as part of their overall social media strategy. By doing so the attention span in relation to a medical conference will increase to months before and months after the event. Not taken into consideration the SMACC (with stands out of comparison by the very nature of this event), the IFAD is the second largest Social Media event next to the Annual Meeting of the Society of Critical Care Medicine in the US. With only a fraction of the SCCM participants (500 at IFAD compared to 5000), the life-span and SoMe footprint of #IFAD2017 was almost as big as #CCC46. If you want to come to an educational meeting next to SMACC, the IFAD may the event you want to go as it offers ongoing release of Open Access Medical Educational Material.